Today in Masonic History Ellis Gibbs Arnall is born in 1907. Ellis Gibbs Arnall was an American politician. Arnall was born in Newnan, Georgia on March 20th, 1907. He attended Mercer University, the University of the South and the University of Georgia School of Law. He was admitted to the bar in 1931. In 1932, Arnall was elected to the Georgia House of Representatives. He was elected 'Speaker Pro Tempore' the second highest position in the Georgia House. He was then appointed at the age of 31 to a vacancy in the office of the state attorney general. 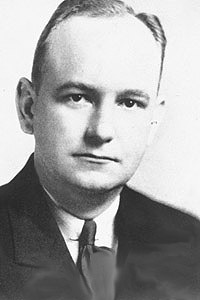 In 1942, Arnall ran in the Democratic primary against the incumbent Democratic Governor who had caused the state's college to lose their accreditation. After winning the primary he had no Republican opponent in the general election and he became the youngest Governor in Georgia history. During his term, Arnall had a variety of changes that he made to the laws in Georgia. His predecessor was considered to have used dictatorial powers during his term. Arnall led the charge to prevent future governors from using that dictatorial style power. He also made a change to the voting laws in Georgia allowing 18 year olds to vote. His theory was that if young men were old enough to serve during World War II they were old enough to vote for their countries leaders. This preceded the 26th Amendment which made the voting age 18 nationally. He also retired the state debt while in office. All of Arnall's efforts won him attention from the national media. In his Georgia he drew the anger of fellow Democrats when he followed the United States Supreme Court decision that banned all white Democratic primaries. He was painted by other Democrats as a race-traitor. This would foreshadow the next time he ran for Governor in 1966. In was in the 1966 primary that his opponent would call him "the granddaddy of forced racial integration." Arnall passed away on December 13th, 1992. He was a member of Corwetta Lodge No. 60 Newnan, Georgia.